Good lighting conditions at your fingertips – Bosch is further expanding their Connectivity system for professionals and, with the Bosch GLI 18V-1200 C Professional and Bosch GLI 18V-2200 C Professional, offering two new cordless floodlights with 1200 or 2200 lumens. 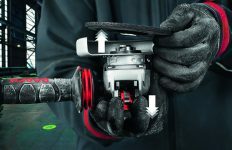 Both tools can easily be controlled via the Bosch Toolbox app meaning you can switch off and on, dim the lights, couple multiple floodlights, activate the timer – all with the tap of your finger. Furthermore, tradespeople can also check the battery’s charging status or PIN the floodlights to control access. Further advantages are a longer runtime and their high IP64 certification for dust and splash protection meaning they can be operated both indoors and outdoors. The Bosch GLI 18V-1200 C Professional, with twelve LEDs and lighting power of 1200 lumens, provides good visibility at any job site. At the same time, it stands out thanks to its particularly long runtime, 80 minutes per amp hour at the highest brightness setting. Using a 6.0 Ah battery, it will keep going for the entire working day. If the floodlight is switched on, it always starts in dimmedmode so that you are not dazzled by it. 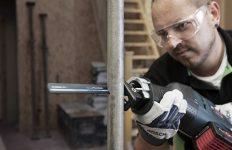 Furthermore, the Bosch GLI 18V-1200 C Professional is extremely robust. The surrounding frame guarantees a reduced wear-and-tear, reliably protects the light fixtures against damage and, at the same time, allows for five different set-up angles. The ¼ inch thread provides even more flexibility, the floodlight is therefore simply screwed onto a tripod and can be positioned as needed. The Bosch GLI 18V-2200 C Professional stands out when compared to its predecessor’s thanks to a newly designed reflector. It increases the brightness from 1900 to 2200 lumens and makes the Bosch GLI 18V-2200 C Professional the most powerful cordless floodlight from Bosch. It efficiently illuminates even large work areas. The tool offers two brightness settings, five set-up angles and a 5/8 inch tripod thread. This means that tradespeople can quickly and easily, set and change the lighting conditions in various work situations. The runtime is 44 minutes per amp hour at the highest brightness setting, or 100 minutes when it is dimmed to 950 lumens. 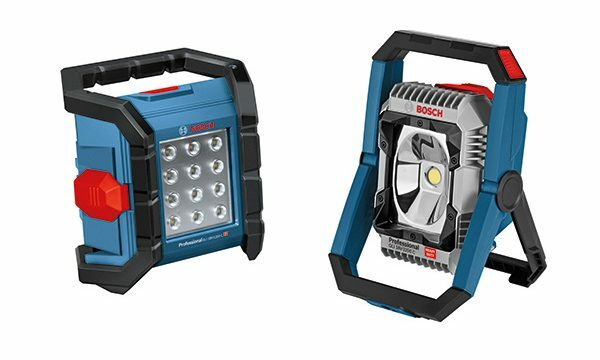 If you are using a 6.0 Ah battery, the Bosch GLI 18V-2200 C Professional will, therefore, light up the job site at the required level of brightness for half a working day to the whole working day. 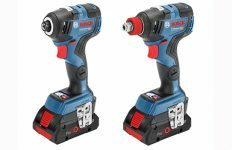 The Bosch GLI 18V-1200 C Professional and Bosch GLI 18V-2200 C Professional are powered by high-performance 18 voltlithium-ion batteries which are part of Bosch’s “Flexible Power System”. 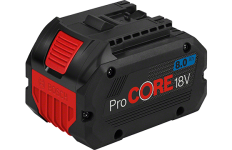 This guarantees compatibility with all new and existing professional power tools and chargers within the same voltage class, leading to greater productivity in day-to-day work. The Bosch GLI 18V-1200 C Professional cordless floodlight is available from October and the Bosch GLI 18V-2200 C Professional is available from September 2018. All prices are recommended retail prices excluding VAT. Subject to change.